Do you offer CME credit? At this time we do not offer CME credit. The feedback that we have received from our customers is that they want a review that is quick, effective and cheap. Customers state they prefer our $250 price over the added cost of CME which most customers easily attain at a conference or by other means. Currently we are the cheapest ConCert review on the market and we intend to remain so. We are welcome to feedback on this issue. In order to offer our customers the most cost effective review, we do not offer CME credit. I forgot to print my receipt during my purchase. How do I reprint my receipt? How often do you update your material? Every year after the exam. We use customer feedback to keep our review high yield. We need your feedback to continue to tailor our review for the exam! Visit the "Contact Us" section online after your exam and let us know tips to improve our book or online course and you will be entered in a drawing to receive your money back! Yes, get your review for FREE! Please provide feedback to content material in the questions and lecture which you feel need better explanation or that you will feel will better improve the course. Please do not provide actual test questions from the test for which the testee is required to sign a non-disclosure clause. To date we have had no failures. If you fail please contact us and we can definitely learn from you about how to improve our course. Plus you will receive your money back if you purchased our online course and High Yield Emergency Medicine Textbook. 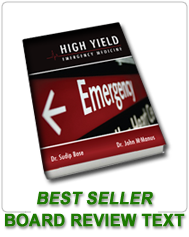 How long will it take the High Yield Emergency Medicine Textbook to arrive? We guarantee 7-10 business days (although most customers in the continental US have received the book within 2 days). We ship immediately and the rest is up to the postal system! All BOARD reviews may be accessed 24/7 until after the testing date. You will have complete access until you take your exam. You can log in as many times as you need, but can only do it from one computer at a time. This allows us to protect our copyrighted materials from being shared. All LLSA reviews will become inactive 24 hours after your initial login for each review (not 24 hours after purchase). However, you can log in as many times as you need to within that 24 hours. If you have the purchased multiple reviews, you may complete each year's review at separate times, they do not all have to be completed in one day. For example if you purchase the 2013 and 2014 reviews, you can do the 2013 one day and do the 2014 another day (a week later, a year later, etc.). Our intention is for you to complete each year's review in one sitting and test immediately in order to make the process as quick, easy and painless as possible. Our suggestion is to allot between 60-90 minutes of your time for one review and 30 minutes for the actual LLSA test on the ABEM website. You may only log in from one computer at a time. This procedure also allows us to protect our copyrighted materials from being shared. The ten year special is by far the best financial deal and has received the most customer satisfaction. Purchase this and you are set for a decade! Not only will you receive the high yield online reviews and be guaranteed to pass your LLSA exam every year painlessly, but you will receive FREE handouts (summary of articles) in the mail every year and access to a FREE online award-winning ConCert exam review when it is time to take your ConCert (recertification) exam. Buy the 10 year package now and forget about having to worry about how to compete your LLSA and study for your ConCert exam! See www.llsaprep.com for details about preparation for the LLSA exams. If you purchase our ConCert Online review + High Yield Emergency Medicine Textbook you will pass your ConCert exam.....GUARANTEED OR YOUR MONEY BACK! This presentation is not working on my Mac/iPhone/iPad. What do I do? Apple currently blocks websites which use Flash player software. You can now download the "Appsverse Photon Browser Flash player for iPad, iPhone, and iPod Touch" for $3.99. Simply search your app browser for the app search word "photon" to find the above app which needs to be installed for viewing on Apple products. After installing, please follow the directions for viewing the website. Sound and quality depend on which version of the iPhone you have, but it will work on the 3G, and especially well on the newer versions. Why is Sudip so good looking? Lots of botox and hair gel! What can I do to get John's muscles? Hours in the gym and staring at yourself in the mirror! ConCert Prep will "pump you up!!!" Thank you for considering our review! We are here to serve you. Do you have other questions?